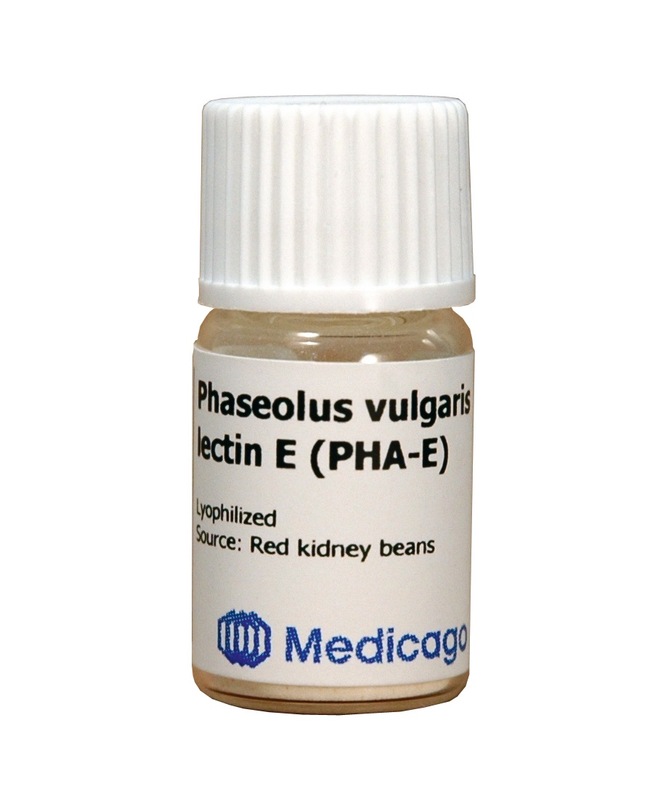 Phaseolus vulgaris lectin (PHA-E) is isolated from red kidney beans and purified by affinity chromatography and ion-exchange chromatography. It is a tetrameric protein with a molecular weight of 128 kDa. The lectin recognizes and binds specifically to terminal galactose, N-acetylglucosamine and mannose residues of complex glycans on mammalian glycoproteins (1). Because of its strong erythrocyte agglutinating activity, it is also known as Erythroagglutinin (PHA-E). PHA-E is not blood group specific (2). Less than 5 µg/ml agglutinates human erythrocytes of type O and agglutination can be inhibited by certain oligosaccharides. Medicago’s PHA-E lectin is supplied as a white lyophilized powder from a buffer containing from 50 mM NH4HCO3. The purity of the lectin in determined by SDS-PAGE, which generate one single band at 34 kDa. It is available in vials containing 5 mg lyophilized powder and the product is to be used for laboratory work only. The lectin may be reconstituted with 2 ml of deionized water before use. Spin the vial gently until full dissolution. Aggregation is thought to occur in the presence of high concentrations of 2-mercaptoethanol. The solution may be reconstituted in this buffer to desired working concentration. The product is shipped at -20°C however for over-the-day transport it may be shipped at ambient temperature. The lyophilized powder is stable for more than three years from production date when stored below -20°C. After reconstitution with deionized water, the solution may be stored frozen in working aliquots for up to 12 months. (1) Chrispeels M. J., Raikhel N. V. (1991). Lectins, Lectin Genes, and Their Role in Plant Defense. The Plant Cell Vol.3, 1–9. (2) Liener I. E., Sharon N., Goldstein I. J., (1986) The Lectins – Properties, Functions and Applications in Biology and Medicine.